Is this where I address my WEEK LONG absence? Is this where I beg forgiveness? Is this where I scold myself for letting the mundane details of my life consume me? I certainly hope not. Because here’s what happened: I was busy. Very busy. And sick. Fairly ill, in fact. Many things happened during this week long sabbatical from blogging. I’m going to start talking about several of those things in just a moment. But I’ve already done enough emotional flogging related to my blogging break. I think that in order for me to successfully maintain this journal, I need to stop giving myself such a hard time about the way I communicate with others. I’m actually quite upset with myself because not only was I too busy to write, I was too busy to read my 21093041787 favorite blogs. Therefore, my google reader is about to hemorrhage from too many exciting blog entries. However, that’s neither here nor there, and yelling at myself on the internet will not turn back the hands of time. ALWAYS WEIGH-IN. I didn’t want to weigh-in today- I was convinced I’d gained weight, and I didn’t feel like dealing with the consequences of my actions. I was in a very low place. However, I told myself that I needed to calm down because how could I change my actions if I refused to even see the results? So I stepped on the scale, totally prepared to see a gain. And I lost. I lost over a pound. 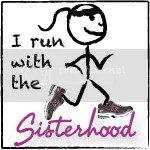 But the point is that I was PREPARED FOR THE GAIN. I was ready to take responsibility for my bad choices (yes, super salty cheese enchilada that was SO not worth the ww pointsplus….I’m looking at you).No matter what kind of ridiculous roller coaster week I’m facing, I need to always remember that the proper way to start over is by getting all the facts. ANYWAY, like I said, this week was very congested (and so was my nose- HAHAHAHA). I made a lot of really interesting food (most of which I didn’t photograph- boo hiss), and I increased my standard pace during week 2 of the Couch to 5k Challenge. 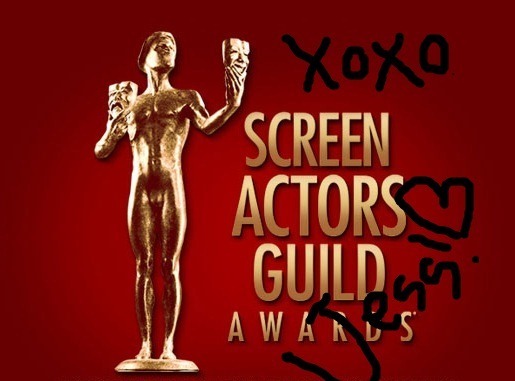 In particular, Sunday night was particularly exciting because it was the live broadcast of the 17th Annual Screen Actor’s Guild Awards. Anyone who knows me is well aware that Awards Season is the Jessamyn Equivalent of March Madness. In other words, Sunday night was essentially my own personal Super Bowl Sunday (yeah, that’s right, I just combined sports metaphors). In honor of the occasion, I decided to make a lot of party related food for one person (one person because, aside from my mother, I’m the only person I know who is obsessed with awards shows). I decided to make guacamole, hummus, and a pizza. 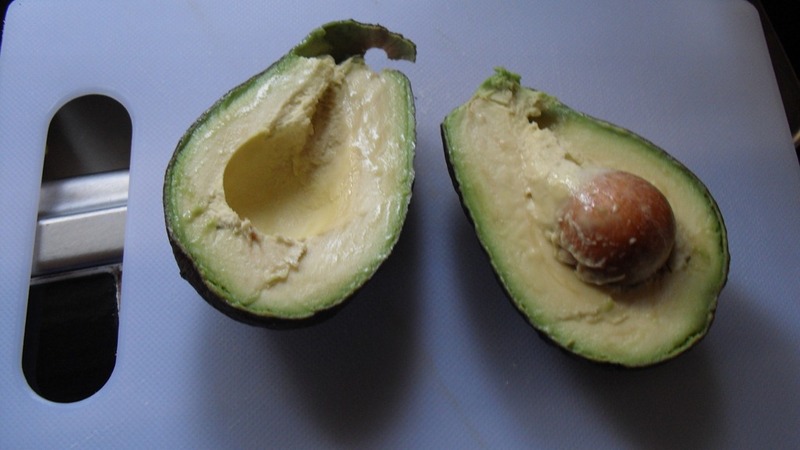 This probably sounds stupid, but I’m 99.9% sure I had never opened an avocado before Sunday. Yes, I’ve eaten avocado- I love avocado. But for some reason, the preparation of fresh avocado is not a very large part of my life. 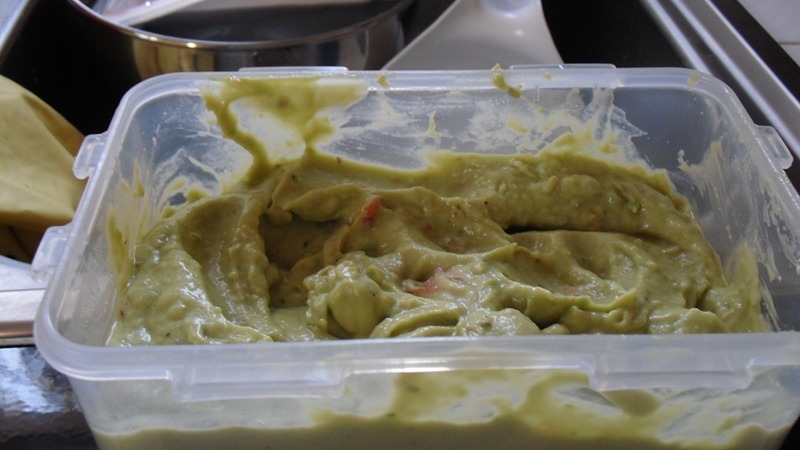 I used a very generic guacamole recipe, i.e throw avocado, onions, salt, and lime juice into a food processor, but there are a few changes I might make. For starters, while using a food processor is time efficient, it creates a fairly smooth consistency. I prefer chunky guacamole, so I might just use a fork to mash up the fruit next time. Also, using ripe tomatoes is usually tastier than using recently picked tomatoes- as a result, I had unnecessarily large chunks of tomatoes (and I hate tomatoes- ok, that’s an overstatement but you get the picture). In addition to the guacamole, I made a batch of hummus using canned garbanzo beans. It turned out ok, but the flavor is a teensy bit off to me. This was my first time making hummus from scratch, and for that reason I’m cutting myself a little bit of slack. Maybe it tasted off because the beans were canned and not fresh- the recipe I used said to use some of the water drained off the beans. In all honesty, I think this added to the weird flavor. In general, canning juices are not know for having the most palatable taste. Whatever, the hummus tastes pretty good in wraps and with homemade corn chips. I just need to futz with the recipe a little. The main event of my SAG Awards Viewing party was the homemade pizza. I’ve been craving pizza for weeks, and I finally had enough time to make a crust from scratch. However, before I started the pizza making process, I decided to fulfill one of my goals: Making turkey sausage from scratch. Now you’re probably wondering: Jessamyn, what does one put in turkey sausage? Well, for someone who follows directions well and reads recipes thoroughly, the ability to rattle off an exact ingredient list is probably second nature. However, if you’re like me and have the natural urge to do things the hard way, then you probably just eyeballed every spice in your kitchen until you came up with something resembling sausage. I mean, making sausage is basically just handmixing a bunch of spices into a mass of raw beast right? (my great-grandmothers are probably rolling in their graves). 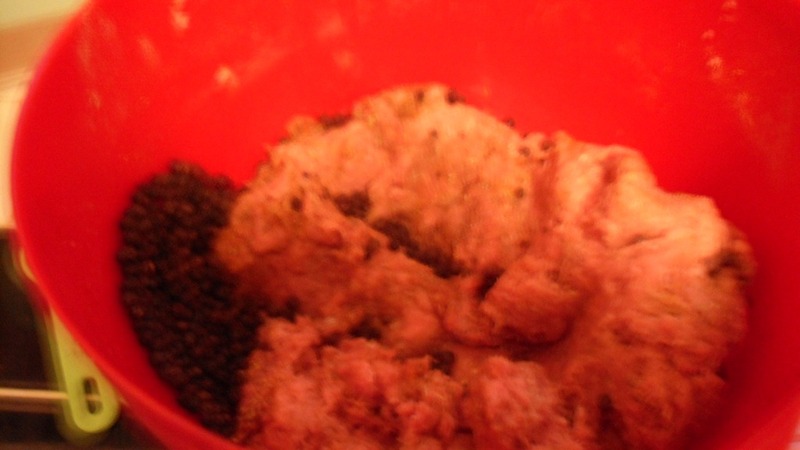 Yeah, that’s right- my gorgeous turkey sausage was marred by accidently dumping half a canister of WHOLE BLACK PEPPERCORNS into the mixing bowl. I wish there was a photo of my face as the pepper fell into the bowl. I’m sure it was priceless. 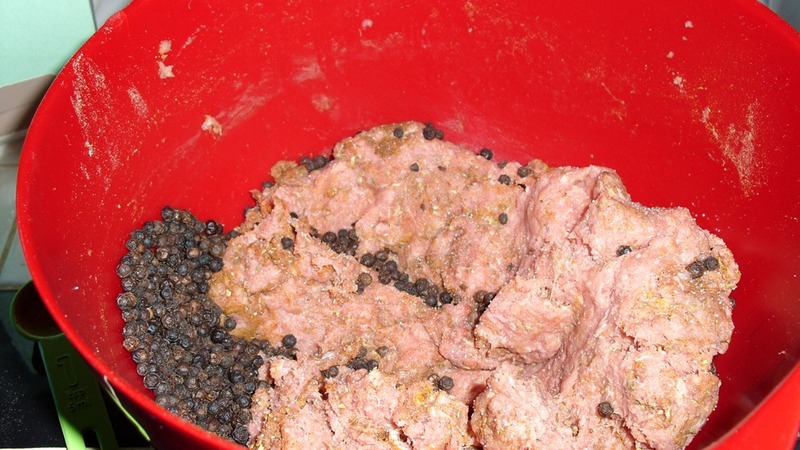 Needless to say, I spent the next 15 minutes individually picking the black peppercorns out of the raw sausage. Yes, I washed my hands often. Yes, I was BEYOND pissed off. But I’m not made of money- there was no way in HELL that I was going to toss out a pound of meat because of a few hundred black peppercorns. And then, miracle of miracles, the crust rose properly! And it was both soft and crunchy. AND I DIDN’T EAT IT ALL AT ONCE (probably the greatest miracle of all). By the way, the crust recipe I used was my own personal spin on a WW recipe- instead of using 4 1/4 cup ( s ) all purpose flour, I subbed in 2 1/4 cup ( s ) whole wheat flour- partially because of the health factor and partially because of the ‘I ran out of all-purpose flour’ factor. A lot of people are afraid of whole wheat flour, but I think it’s perfectly delicious. Combine the water and sugar in a measuring cup. Sprinkle in the yeast and let stand until foamy and lagoon-ish, about 5 minutes. Stir in the oil. Combine the flour and salt in a food processor, stand mixer, or with your bare hands (like in olden times- just pretend you are someone’s Italian grandmother). With the machine running (if you don’t feel like busting it out with your hands), scrape the yeast mixture into the bowl; pulse until the dough forms a ball, about 1 minute. If necessary, turn the dough onto a lightly floured surface and knead briefly until smooth and elastic. Spray a large bowl with nonstick spray; put the dough in the bowl. Cover the bowl lightly with plastic wrap and let the dough rise in a warm spot until it doubles in size, about 1 hour. Punch down the dough, then cut in half. Refrigerate or freeze in floured zip-close freezer bags at this point or use as directed in the recipe. Yields 1⁄12 of dough per serving. 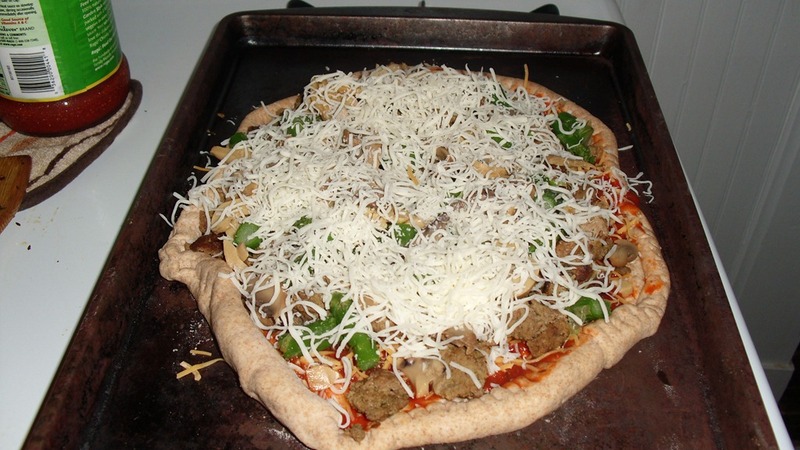 I only used 1/5 of this recipe to create my Sunday night pizza. The dough can be used in a lot of different recipes, and I have big plans for homemade calzones later this week.